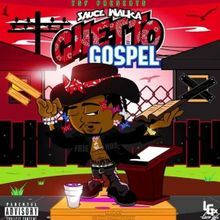 It’s Sunday so not to sound like a televangelist but I’m about to dress like an old-timey, fast-talking frontier town preacher (a la Sauce in the artwork for this single) and hit y’all with a little with a little gospel, the Ghetto Gospel that is. This is Sauce Walka at his downright, well, sauciest. Spitting some real knowledge/life experience over a shimmery beat apparently from Kingdom Hearts (and French Montana). I can’t blame him for having his mind on boudan; and all this talk of boudan has got me feeling like Kevin Belton. It’s too early to say but definitley could be in the mix for a song of the year contender for me.